Interpol is cooperating with Australian authorities after 20-year-old Australian model Miss Sinead McNamara was found dead on the deck of a superyacht in Greece. The owner of the yacht is Mr. Alberto Bailleres, a Mexican businessman (pictured with Mexican President Nieto) with an estimated net worth of $9billion. Mexican police said they would cooperate but claim that Mr. Bailleres could not be located. Miss Sinead McNamara was found dead on Friday in one of the bedrooms of the Mayan Queen IV, a famous $150 million yacht. 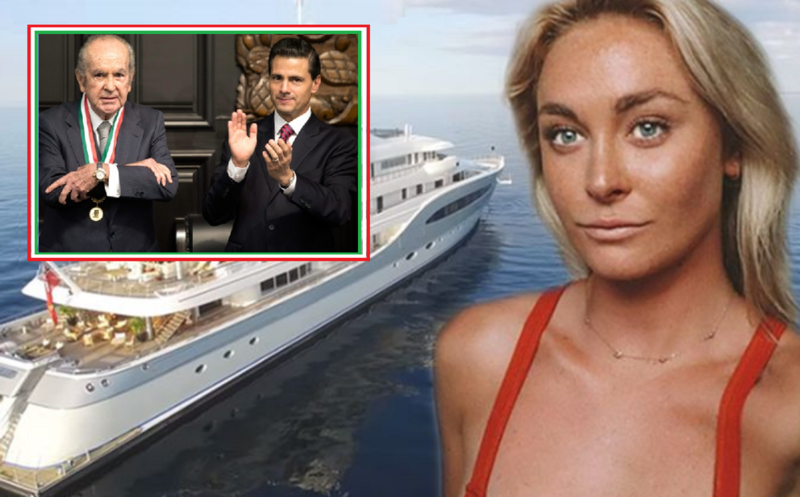 The model had been working for four months on the ship of the Mexican businessman Alberto Bailleres (who famously likes to surround himself with young beautiful women). This week the ship was moored off the coast of the Greek island of Kefalonia. Just this Tuesday, young Miss McNamara had put a picture of Kefalonia on her Instagram page, it would be her last post. How the model died is still unclear, but the Greek police confirmed that they have opened a murder investigation. Mexican billionaire Mr. Bailleres is said to have left the ship shortly after docking in Kefalonia and was not present when McNamara was found. The staff stayed behind and found the dead girl. “The Coast Guard of Kefalonia has ordered an investigation into the circumstances that led to the death of the 20-year-old Australian national as well as an autopsy-necropsy,” local newspaper ‘In Kefalonia’ reported. The Mayan Queen was scheduled to set sail today Sunday, 2 September, but pending an investigation outcome, Greek police have ordered it to remain docked in the port of Argostoli until detectives have interviewed all crew members and a forensic examination of the vessel. McNamara's family remains in shock: "This is the worst news of my life," says her brother Jake. Miss Sinead McNamara traveled around the world on big yachts in recent years. She kept her 14,000 Instagram followers up to date with photos and videos. There's An Old Saying: if You Marry For Money, You'll Earn Every Penny Of It.